Posted on Fri, Dec 10, 2010 : 3:36 p.m. Donate a toy valued at $10 or more and get a tattoo worth $100! Toys and tattoos don't generally go together, but for the last two holiday seasons, Ypsilanti, Depot Town Tattoo and Dawn Cooke have proven the exception. On Saturday, Dec. 11 from 1 to 11 p.m Depot Town Tattoo will hold its Toys for Tats drive where anyone donating a toy worth $10 or more will receive a free tattoo. "I remember how sad I felt when I woke up one Christmas morning and all that was under our tiny tree was a pack of underwear," says Cooke. "I grew up in a really poor household with a single mom, and we didn't have a lot. I'm fortunate enough to tattoo for a living, and it's great to have my partners and my peers back me up in giving back during the holidays." The idea is Cooke's, but her partners are just as good-hearted and talented. Last year, the event was so popular they had to turn people away. The Depot Town Tattoo staff delivered a haul of toys to a two local orphanages and a community center for low-income housing, brightening a lot of holidays for kids in Washtenaw County. "Everyone wins at this event," says Cooke. 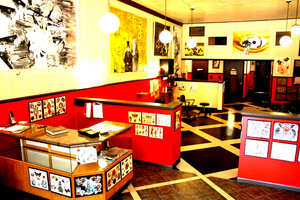 "We're a lot more than a tattoo shop. We hold art openings every three months and invite our community to celebrate local and national artists. Toys for Tats is becoming a cool tradition that we hope we can continue for years to come." For Saturday's event, the doors will open at 1 p.m., and Dawn and four other artists will tattoo for 10 hours straight — a feat of endurance she's happy to tackle for a second straight year. An art opening for Niki Urban and Tom Burns will also start at 8 p.m. with wine and hors d'oeuvres. "We were overwhelmed last year," says Cooke. "This year, I'd suggest getting here early and signing up before all our spots fill up." Clients are encouraged to sign up and make appointments for any time during the Toys for Tats event, and then return when it's their turn. Dawn and her partners aim to complete around 150 tattoos before they close up shop. "We'll have a 20x30 sheet full of tattoo choices, designs we've picked because we liked them and we thought they'd be fun to do," says Cooke. "There'll be about 40 — some traditional but all of them really cool. There's a hot devil Santa Claus I'm partial to. I really hope I get a chance to do that one." Tattoos that would normally cost $100 can be had for the price of a cool toy thanks to the generosity of the Depot Town Tattoo staff. They'll donate their time, energy, skills and ink to collect a giant sack of toys and make the event as fun as possible. "Everyone's worked really hard this year, and I appreciate the support of my coworkers and friends," says Cooke. "They all make this event the success it is. We hope to see a lot of familiar faces on Saturday." Richard Retyi writes the bi-weekly-ish column "Lie to Your Cats About Santa". Follow him on Twitter at twitter.com/richretyi, read more of his AnnArbor.com work here or check out his co-blog In Bed By Eleven. He also LOVES getting emails. Send him one at richretyi@gmail.com and see what happens. Tue, Dec 14, 2010 : 12:22 p.m.
@Pinky &amp; MGonzago - I think judging books by their covers is still very much in fashion, especially when those books have giant skulls on their necks. Tue, Dec 14, 2010 : 11:53 a.m. I'm not suggesting that ink and a responsible job are incompatible. (I have both.) But I wasn't aware that "judging books by its covers" had gone out of style. Tue, Dec 14, 2010 : 8:06 a.m.
@ mgonzago, I think that old stereotype is pretty much done with in the 21st century. I know plenty of folks that make a very good livings that have ink. Time to get with the program and stop judging books by its covers!? Tue, Dec 14, 2010 : 1:09 a.m. The thought is appreciated, but is this really what we need? I'm sorry to all you young folks who think covering your body in ink is fun, good luck getting a professional job. Mon, Dec 13, 2010 : 3:56 p.m.
@ViGHa - Coincidentally, I know the person who received that tattoo from Dawn and it's a tribute to her kitty cat. @proudparent - Sorry your experience didn't pan out like you hoped. I assume you still donated your toy and even if you didn't get your tattoo, at least you'll make one lucky kid very happy this holiday season! @pinky - Hope the bunny turned out! Mon, Dec 13, 2010 : 2:15 p.m. They told me they couldn't Tattoo what I wanted because it was too complex, so I opted for a Bunny rabbit on my foot. Sun, Dec 12, 2010 : 10:26 p.m. I went and donated the toy. Got a time slot to return for my tattoo. Came back in alloted time frame (8-9), waited around until 1am, and then was told they were done with giving the tattoo's. Thanks for making me wait 5hrs for nothing. I would have still given the toy. Maybe next year you should only take the first 150 people. Dont bite off more than you can chew. Beleive me, people will still donate. Sat, Dec 11, 2010 : 8:40 a.m.
while dawn cooke is obviously talented, anyone else think a kitten in a hot air balloon is a bit unusual for a tatoo? Fri, Dec 10, 2010 : 5:12 p.m. I'm afraid that I misread this the first time around as "Tats for Tots". I believe your thinking of the new reality TV show scheduled to debut as soon as that idea its the top of the pile.